Non-ST-elevation acute coronary syndromes (NSTE-ACS) are the most frequent acute coronary syndromes 1. NSTE-ACS can be further subdivided into unstable angina and non-ST-Elevation myocardial infarction (NSTEMI). Both forms of coronary artery disease usually have lower in-hospital mortality than STEMI. In each patient with NSTE-ACS a risk assessment should be performed, because every patient is different. As in ST-segment elevation myocardial infarction, is usually the result of coronary artery occlusion related to atherosclerotic plaque rupture, ulceration, fissuring, erosion, or dissection with resulting intraluminal thrombus in one or more of the coronary arteries 1. The electrocardiogram continues to be the main diagnostic tool in non-ST-elevation acute coronary syndromes. According to the European Society of Cardiology Guidelines, a 12-lead EKG should be performed and interpreted within 10 minutes of the patient’s arrival at an emergency facility 2. Electrocardiogram in NSTE-ACS is different in each patient. EKG findings could vary in the same patient. 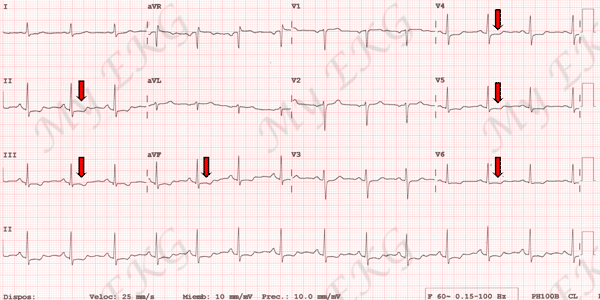 The most common EKG abnormalities are ST depression in contiguous leads with or without negative T waves. The electrocardiogram may be normal in a NSTE-ACS, especially in the absence of symptoms. 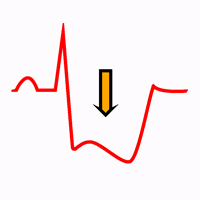 Serial EKG in symptomatic patients with an initial non-diagnostic EKG should be performed. Remember: If there is ST depression associated with ST elevation, is an EKG of ST-segment elevation myocardial infarction (STEMI). NSTE-ACS most commonly presents as a pressure-type chest pain and can radiate to either or both arms, the neck, or the jaw 4. Patients with NSTE-ACS may also present with dyspnea, diaphoresis, nausea, abdominal pain, pleuritic chest pain or syncope. If symptoms increase with physical exertion or improve with rest or after administration of nitrates support a diagnosis of ischemia. Prior coronary artery disease, older age, male gender, peripheral arterial disease or cardiovascular risk factors (diabetes mellitus, renal failure, etc ...) are clinical findings that increase the probability of NSTE-ACS 2 4. Transient EKG changes during symptoms at rest strongly suggest non-ST-elevation acute coronary syndrome. ST segment depression in inferior leads and in leads V4-V6 (red arrows). ST segment changes or T wave invertion during symptoms with normal EKG after symptom relief is diagnostic of non-ST-elevation acute coronary syndrome. A completely normal EKG in a patient with chest pain does not exclude the possibility of NSTE-ACS. In particular, ischemia in the territory of the circumflex artery or isolated right ventricular ischemia frequently escapes the common 12-lead EKG. Patients with chronic coronary artery disease, bundle branch blocks, pacemaker or left ventricular hypertrophy may have ST or T waves changes in previous EKG. Elevations of specific biomarkers such as cardiac troponin I and T or CK-MB in the blood reflect injury leading to necrosis of myocardial cells 3. Therefore, in the context of chest pain or ST-segment-T wave changes, elevations of troponin or CK-MB is diagnostic of acute coronary syndrome once other causes of elevations of biomarkers (pulmonary embolism, myopericarditis, aortic dissection) have been ruled out. In patients with normal EKG with symptoms, the elevation of biomarkers helps to diagnose non-ST-elevation acute coronary syndrome. Troponin and CK-MB are normal in patients with unstable angina. Non-ST-elevation acute coronary syndrome treatment should be individualized. Supplemental oxygen if oxygen saturation < 90%..
Sublingual nitroglicerin or intravenous nitroglicerin in patients with continuing ischemic pain. Morphine sulfate intravenously if there is continued ischemic chest pain. Antiplatelet therapy: Aspirin + clopidogrel or ticagrelor. Anticoagulant therapy: Low-molecular-weight heparin (enoxaparin), bivalirudin, fondaparinux or unfractionated heparin. Oral beta-blocker therapy should be initiated in patients who do not have signs of heart failure, evidence of low-output state, increased risk for cardiogenic shock or contraindications to beta blockade (AV block, active asthma or reactive airway disease). Invasive coronary angiography, followed if indicated by coronary revascularization, should be performed in the majority of patients with a NSTE-ACS 2. Depending on the patient’s clinical condition and the estimated risk, it may be: Immediate (first 2 hours), early (within 24 hours) or delayed (within 25 to 72 hours). In each case patients may require percutaneous coronary revascularization (stents) or coronary artery bypass surgery. Non-ST-elevation acute coronary syndromes are a group of clinical conditions caused by the rupture of an atheromatous plaque in a coronary artery, which generally reflects an acute subtotal coronary occlusion. NSTE-ACS includes the acute coronary syndromes without ST elevation; atypical presentations of STEMI are excluded. So its clinical presentation varies over a wide spectrum in both symptoms and electrocardiogram changes. Remember: If NSTE-ACS is suspected, serial EKG should be performed and cardiac troponin should be measured in symptomatic patients with an initial non-diagnostic EKG. Initial treatment is similar to any acute coronary syndrome, but unlike STEMI, the time of the coronary angiography depends on patient's clinical situation. 2. Roffi M, Patrono C, Collet JP. 2015 ESC Guidelines for the management of acute coronary syndromes in patients presenting without persistent ST-segment elevation. European Heart Journal (2016) 37, 267–315. 4. Amsterdam EA, Wenger NK et al. 2014 AHA/ACC Guideline for the Management of Patients With Non–ST-Elevation Acute Coronary Syndrome. Circulation. 2014; 130: e344-e426.